The basic structure of all the buildings on the west side has not changed over 100 years. Most of the first block, up to Union Street, was built between 1807 and 1820. However, the brickwork and style of No. 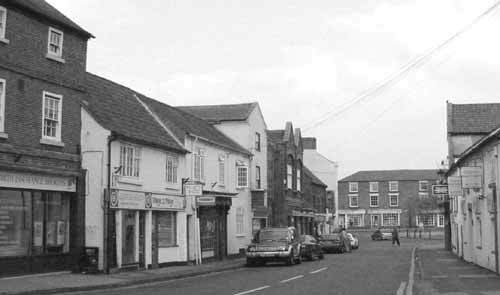 18, at the extreme left of the picture, is so similar to the Post Office building on the corner of Long Acre that it was probably built earlier as an extension to the Needham’s house, around the late 1700s. As for the remaining houses up to Union Street, with the notable exception of No. 12, only the shop-front designs have changed radically. Looking above fascia level, there are some intriguing changes that do not necessarily fit in with our conceptions of Georgian/ Victorian style. On the extreme left, in 1900, No. 18 Would’s sweet shop, also selling Maypole Tea, appears to have a Georgian pattern of glazing bars but on the first and second floors there are in fact, opening casements which are possibly Yorkshire sashes. The four white stone steps that lead to the front door of the upstairs accommodation in c.1900 have now gone but anyone who is interested can peer behind the litter-bin outside the Insurance Brokers to discover where they once were. Next door, No. 16, the hanging kettle sign indicates J. M. Wright Ironmongers shop who, c.1900, took over the business from John Roworth the Tinsmith (below). With the adjoining cottage, No. 14, all three rooms have casement windows in 1900 that have now been replaced with modern frames of similar appearance but with fanlights. At some time, probably post WW2, the roof ridge height over the two premises has been increased to line up with the adjoining property. 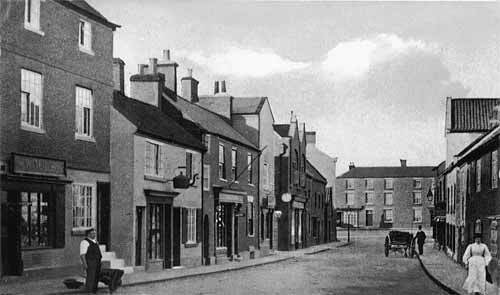 During the nineteenth century many craftsmen lived and worked in Bingham, among them tinsmiths, such as J. Roworth of Market Street and Browns of Market Place. They would have made, sold and repaired any household item in tin plate or copper. 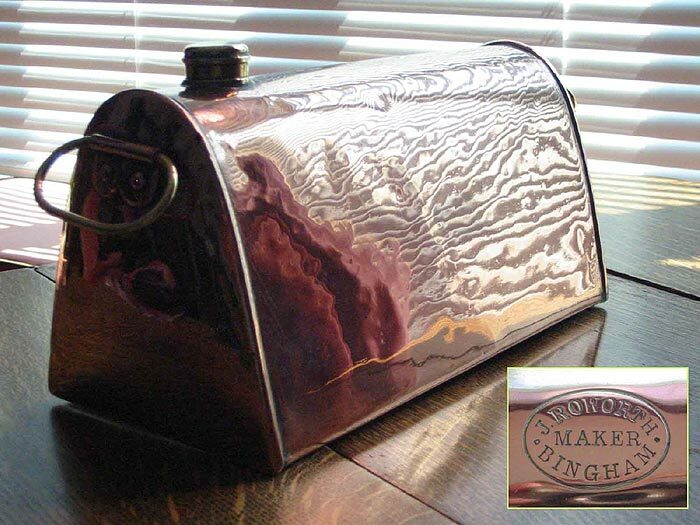 This is a copper warming bottle made by John Roworth between 1879 and 1896. Robert Roworth, tin man and brazier, first appears in Kelly’s Directory in 1844. It is presumed that John Roworth is his son. In the later directory entries John Roworth is listed as selling china as well as being a tinsmith and brazier. No. 12, now the Fish and Chip shop, appears to have been built as a shop with associated living accommodation at street level and on the first floor. In c.1900 this was John Marston’s barber shop, indicated by the angled pole and a sign offering ‘Shaving’. Both the pole and sign look identical to those on a 1920s picture of No. 31 Market Place when the barber was Harry Harwood. There are clearly two entrances to No. 12, one to the shop and one to the house, with the fascia spanning the shop window and the doorways. This original shop front remains intact, complete with ornamental corbels. The sash windows seen in 1900 have been replaced with modern casements. Between Nos. 12 & 14 there was an arched entrance to a passageway leading to the rear of the property. The arch has been replaced by a lintel and door, the small windows above have been bricked up. On the corner with Union Street, No. 10, is a rather grand stuccoed town house. At the time of the c.1900 picture, the hanging clock, and directories, indicate that it was owned by a watchmaker, George Cooke. It is now, in 2004, an Estate Agents. A window has been installed in the gable at some times since c.1900. On the opposite corner of Union Street is another ‘prestige’ building, No. 8, erected in the early 1900s to replace the earlier premises of Hardstaff & Brown the grocers who also owned other shops in the town. James Hardstaff was first listed as a grocer in Market Street in 1829. Over the century, the building has maintained its links with the grocery trade; in 1933 it was bought by the Heafford family and is now a Costcutter supermarket. Three assorted buildings make up the rest of Market Street on the western side. Firstly, a double-storey cottage, which c.1900 was occupied by William Rudford, the County Court Bailiff. The barn-like building next door, was his depository. The third structure in this group, a single-storey pitched roof building, was Downing the Butchers from 1896 until it became Hopkinson’s, that closed in 1996. All three premises, numbered 2a to 6, now form the DIY Handicentre. The white gable end seen beyond is No.1 Market Place which has the only chimney stack in this view, strangely in neither picture does it appear to have chimney pots. Across the end of the street, on the north side of Market Place, can be seen Nos. 13 to 16, built in 1850. In 1900 the end corner unit was Hardstaff & Browns ‘Top shop’, later to become ‘Tip Top Bakery. Nos.15 and 16 were used as a boarding school in the 1860s. In 2004 the building accommodates a Dress and a Video shop and a Chinese restaurant. Before WW2 Nos.15 and 16 served as the RDC office and during the war as an ARP post. Finally, as the 2003 picture shows, more buildings have been painted white with the associated loss of character and detail. For example, the 1900 photograph of Market Street, shows an interesting variation in brick colour between Nos. 16/14 and No. 12 that is denied to today’s viewer.